I thought maybe the turf crew would ease into this job, seeing that they were getting started on a Friday. I thought they'd get a few rolls of turf done, call it a weekend, and then start fresh on Monday. As of Sunday afternoon, the ENTIRE FIELD was covered in turf. The 4-man crew worked all Saturday and Sunday, in addition to Friday...about 14 hours each day to get the field where it is now. See below for some great pictures of what is shaping up to be not just a generic turf field, but a beautiful turf field, worthy of the tradition that has developed in Orrville over the last 50 years. It has been neat to see the steady stream of folks dropping by the stadium to check out the progress. I heard someone remark that if $1 could be collected for each passerby, this project would have long been paid for. The work of actually rolling out the turf began bright and early Friday morning and by lunch time Friday, this is what it looked like. It was about 30 yards of turf that was rolled out....in 5 yard strips that ran the width of the field. A second 5-yard strip was laid over top and sewn together. The completed 10 yard section was then flipped into place and pulled tight. Rinse & repeat until you have 120 yards of turf on the ground. Not terribly complicated, but very tedious and extremely labor intensive. By Saturday afternoon, this is what the field looked like. Thanks to Mike Guster for the picture. Click here to see the picture full-size & zoom in for lots of detail. As you can see in that picture...by Saturday afternoon, roughly 36 hours after install had began, 100+ yards of turf had been set into place. The sideline pieces weren't yet installed, but that would come on Sunday. As you can see, the sideline section on the visitor side has been rolled out and as I was leaving, the crew was preparing to do the same on the home side. If you notice the black line in the picture above, I'm told that's part of the soccer boundary lines. Typically you see soccer lines that are yellow. But it was decided on black for this project, and personally I like it. Black is a school color and it blends better with green too. Here are two panoramas, one taken on Friday and one taken on Sunday that give an idea on how much progress was made this weekend. 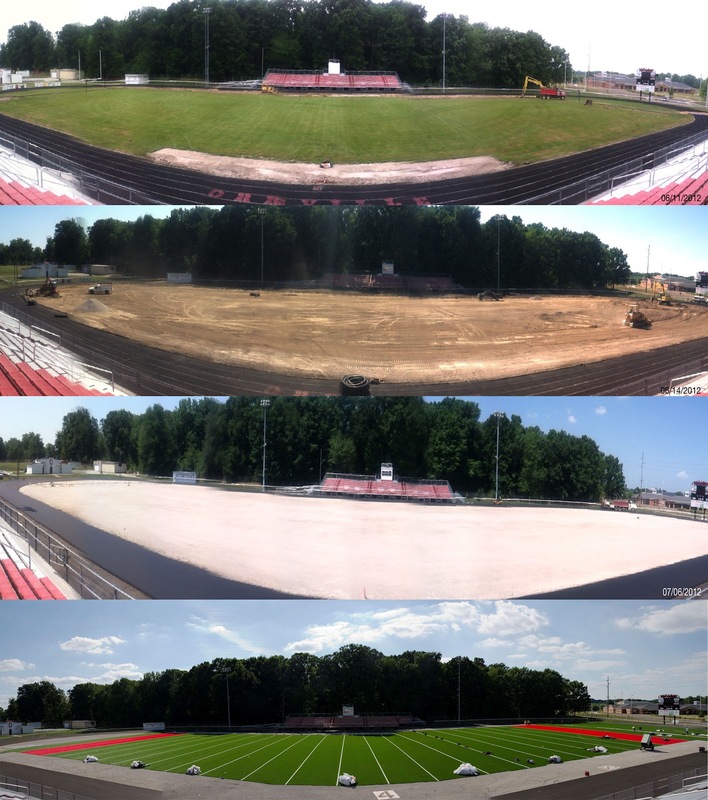 Lastly, I put together a quick collage of these panoramas I've been taking, to show the field as it stood on June 11th with a full field of natural grass and how the field now stands with the grass removed, the field graded and with new turf just over a month later. It's amazing really. So...a lot has been done...but A LOT is left to do. The typical install takes 2 to 3 weeks, and we're just done with day number three. Probably 10-14 days of work left. Now that the turf is rolled out, the next big job will be to stretch the carpet tight and anchor it down and trim off the excess turf. Once that is done, work will begin on the details of the field like hashmarks, yard numbers, soccer lines and the end zone lettering. The field will then have a sand and rubber infill raked in to provide cushion. As I mentioned in the last update...once the field is entirely finished, the track crew from VASCO will move back in to apply the latex topcoat to the track. So the field will be ready for use, but no games or practices will be able to take place until the work on the track is complete. It will be at this time that the stadium will be virtually off-limits because of the work on the track. More to come....but man is this awesome to see.